Soak Kodo millet 30 minutes before cooking. Put millet in the pressure cooker and add water. Add a few drops of oil and ¼ teaspoon of rock salt. After the first whistle, reduce the flame and cook for 8 more minutes. When the pressure is gone, open the lid and mix the rice once. Close the lid and keep the cooker aside. Meanwhile roast all the items under ‘To dry roast & grind’ in the same order except turmeric powder. Let the items cool. Then grind the ingredients after adding turmeric powder and make a coarse powder. Keep this powder in a closed container so that the aroma does not leave. Heat 1 teaspoon of oil in a pan. Add brinjal pieces and little bit of salt. Saute the vegetable till it becomes tender. Sprinkle some water if required. When it is ready, turn-off the stove and keep it aside. Take another pan. Heat 2 teaspoons of oil. Roast cashewnuts first and keep them separately. In the same oil, add cumin now. When it splutters, add chopped onion and curry leaves. Saute till the oinion becomes golden brown. Add brinjal and sauté for a while. Now add the powder and sauté for few minutes. Add cooked millet rice in the pan and mix thoroughly. Adjust salt as per taste and turn-off the stove. Finally add the roasted cashewnuts. Serve hot with onion raitha. 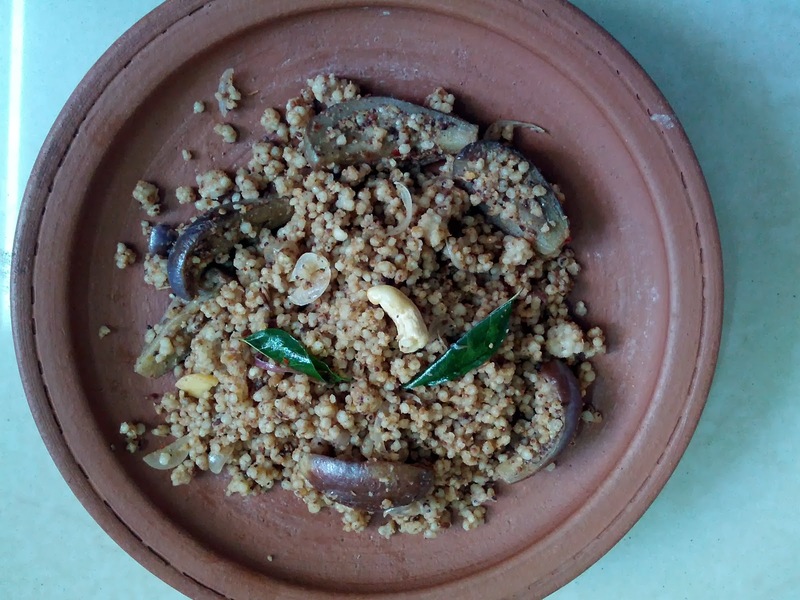 We have learnt this recipe from here and tried with Kodo millet instead of rice. It tasted great. You may also use Barnyard or Little millet instead of Kodo millet. You may add few more red chillies or pepper to make it extra spicy.